Lama Zopa Rinpoche is aided by Ven. 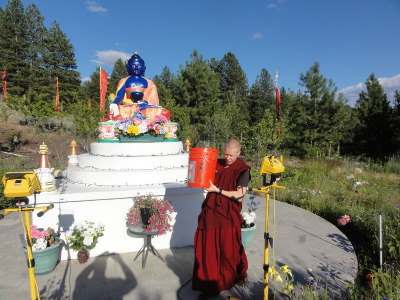 Holly Ansett in circumambulating small animals around holy objects.Lama Zopa Rinpoche has requested the Sangha at his house to do the practice of animal liberation every week dedicated to anyone who is sick or having life obstacles. Ven. Holly Ansett circumbulating worms around holy objects.Rinpoche’s house, reciting mantras and blessing them with mantra water before they are carefully liberated in a safe place. Extensive prayers are made for the long life of His Holiness the Dalai Lama and Lama Zopa Rinpoche and all our kind teachers, the Sangha and anyone who is sick and requesting prayers. This is something amazing to rejoice in, and something you can make offerings toward, especially if you are sick or would like to offer on behalf of someone else who is sick. Any extra money remaining in the fund is offered toward larger animal liberations held in Singapore and Hong Kong. Or simply send your check in US dollars payable to FPMT Inc. and write “Animal Liberation Fund” on the memo line. 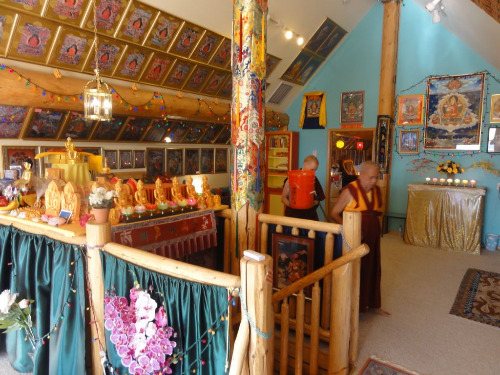 The Animal Liberation Fund is a project of FPMT Inc. and is administered by FPMT International Office located in Portland, Oregon, United States. All donations made to this fund are tax-deductible within the United States in accordance with IRS Code article 501(c)(3) to the extent allowed by law. Buddhism is not at all a tactful religion, always trying to avoid giving offense. Buddhism addresses precisely what you are and what your mind is doing in the here and now. That’s what makes it so interesting.